What is Microsoft Office 365 Mobile Apps? Microsoft Office 365 mobile apps is a powerful suite of mobile productivity solutions that empowers businesses and teams to stay connected, access their documents and files from any location, and work productively. The mobile office suite can also be availed for personal, educational, and nonprofit use. The enterprise mobility suite is designed for mobile devices, tablets, and smartphones which include Windows tablets, Windows phones, iPhones, iPads, and Android tablets and phones. It is a component of Microsoft Office 365 an industry-standard family of client software, server software, and services offered by Microsoft. With Microsoft Office 365 mobile apps, employees and other office application users will be able to view, edit, and create documents on the familiar Office 365 user interface that is optimized for smartphones and tablets. The mobile apps also integrate with OneDrive and SharePoint, a set of cloud-based file-sharing and storage products and services which allows users to securely view, co-author, and share documents with their teammates wherever they are and keeps the documents up to date across the devices within and outside their organization. The enterprise mobility suite provides email and calendaring solutions that permit easy access to content, conversations, tasks, and schedules from any mobile device. Users can set up group inboxes that are synchronized across multiple mobile devices, as well as track the availability of their coworkers. Microsoft Office 365 mobile apps are equipped with mobile data security capabilities, helping users protect their business or organization from any potential threats at different levels. Having the ability to work anywhere is the goal that Microsoft wants teams and employees to achieve. This is the reason why the tech giant has developed a suite of mobile apps that utilizes the familiar interface of its popular office solution known as Office 365. The Office 365 mobile apps, therefore, enable users to access, view, and edit their documents wherever they are and whatever mobile device they are using. They will be able to work from any mobile device they are most comfortable with, whether it’s a Windows, Android, or an iOS device. The apps also help organizations provide a consistent experience to their employees as they work from multiple mobile devices. 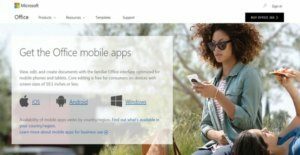 Office 365 mobile apps integrate with Microsoft’s file-sharing and storage products and services which include OneDrive and SharePoint which can be accessed in the cloud. With OneDrive, users can preview over 270 common types of files such as Adobe and Visio files, as well DICOM (Digital Imaging and Communications in Medicine) medical image files. They can preview and access these files anywhere by simply using a mobile browser. In addition, OneDrive permits them to automatically synchronize their documents between their desktop computers and mobile devices. As OneDrive integrates with Office 365 mobile apps, the process of sharing files and documents and collaborating on them is simplified. Users will be able to confidently share files with their colleagues so they can review them and perform editing tasks. While their teammates work on the shared files and documents, they can track all the tasks and activities they made on the files and documents and keep their coworkers connected and updated. Meanwhile, SharePoint provides Office 365 mobile app users with advanced collaboration capabilities. For instance, they can manage and control how files or folders are being shared and distributed within team sites or intranet sites. The enterprise mobility suite’s integration with OneDrive and SharePoint delivers a convenient and seamless co-authoring experience to users. Through the aid of powerful search and discovery tools, they can quickly search for the files they need and gain insights about them. As they co-author documents, they can access a wide range of tools which enable them to add notes and comments to documents as well as highlight important texts or areas within them. They can even co-author documents while they are offline. When they go back online, the documents will be automatically updated with whatever changes or edits they have made. In addition, they can begin co-authoring a particular document on one device and continue it on another device. Office 365 mobile apps also deliver business-class email and calendaring capabilities to teams and employees. They can easily create schedules from any mobile device of their choice anywhere and have their coworkers keep track of such schedules. Because the mobile office suite synchronizes calendars contact, information, and emails across mobile devices in real time, users are ensured that they are able to access up to date information related to their schedules, tasks, and discussions; regardless of the type of device they have. The enterprise mobility suite allows users to create emails in various formats and even insert custom images to emails. It also offers a 50 GB storage, which is large enough to save all the emails they want. Additionally, the mobile office suite allows the sending of email messages with a maximum file size of 150 MB, giving users the ability to send large email messages and attachments. The email capabilities of Office 365 mobile apps make sure that corporate emails are protected from cyber threats and attacks so that confidential and sensitive company and customer information won’t be accessed by hackers, and that there is a continuous flow of communication within the organization and outside it. Thus, the apps are built with industry-leading anti-malware and anti-spam filtering features, securing emails from sophisticated and evolving threats. The enterprise mobility suite guarantees that data and information are protected even if they are not being transmitted through email. Thus, it provides a mobile data protection solution that guards data against threats at any level. It enables users to secure access to data and mobile devices, detect threats that originate from mobile apps, and remove harmful contents from their data. Office 365 mobile apps also have a mobile device management feature which lets users manage and control how employees are accessing mobile data across a wide range of tablets and smartphones. Microsoft Office 365 enterprise mobility suite is comprised of three mobile apps that extend and enhance the features and capabilities of the popular and widely used desktop applications from Microsoft which are Microsoft Word, Microsoft Excel, and Microsoft PowerPoint.The mobile apps are equipped with the familiar user interfaces of the popular desktop applications. Other useful mobile apps are included in the suite such as OneNote, Outlook, and more. Its word processing mobile app permits users to utilize the page and paragraph layout and formatting tools found in Microsoft Word. They can apply custom colors to texts and shapes, custom shading and borders to table cells, add and customize headers and footers across pages, implement image shadows and reflections, and add and delete chart elements. Meanwhile, it delivers a spreadsheet mobile app where users can work on their data using the interface of Microsoft Excel. The mobile app enables them to convert data into maps as well as modify the appearance of pivot tables by applying custom styles and layouts. To wrap it up, the mobile office suite gives users the ability to create and deliver impressive and amazing presentations straight from their mobile devices, as it puts the powerful capabilities of Microsoft PowerPoint on the palms of their hands. They will be able to rapidly build and design professional-looking slides, apply fluid transitions to documents, select and change objects using a pen, store ink annotations from slideshows, and access speaker notes while they deliver their presentations. If you are considering Microsoft Office 365 Mobile Apps it could also be beneficial to investigate other subcategories of Best Office Software listed in our database of SaaS software reviews. Every enterprise has its own characteristics, and might call for a specific Office Software solution that will be fit for their company size, type of clients and employees and even individual niche they deal with. It's not wise to count on locating an ideal app that is going to be suitable for every business regardless of their background is. It may be a good idea to read a few Microsoft Office 365 Mobile Apps reviews first and even then you should pay attention to what the service is supposed to do for your company and your employees. Do you require a simple and straightforward service with only essential functions? Will you actually make use of the complex functionalities needed by experts and big enterprises? Are there any particular tools that are especially useful for the industry you work in? If you ask yourself these questions it is going to be much easier to locate a solid software that will match your budget. How Much Does Microsoft Office 365 Mobile Apps Cost? We realize that when you make a decision to buy Office Software it’s important not only to see how experts evaluate it in their reviews, but also to find out if the real people and companies that buy it are actually satisfied with the product. That’s why we’ve created our behavior-based Customer Satisfaction Algorithm™ that gathers customer reviews, comments and Microsoft Office 365 Mobile Apps reviews across a wide range of social media sites. The data is then presented in an easy to digest form showing how many people had positive and negative experience with Microsoft Office 365 Mobile Apps. With that information at hand you should be equipped to make an informed buying decision that you won’t regret. What are Microsoft Office 365 Mobile Apps pricing details? What integrations are available for Microsoft Office 365 Mobile Apps? If you need more information about Microsoft Office 365 Mobile Apps or you simply have a question let us know what you need and we’ll forward your request directly to the vendor.